Where the coastline begins to curve gently in the lower center of the picture lies the West Bank. Photo by the ISS Crew Earth Observations Facility and the Earth Science and Remote Sensing Unit, Johnson Space Center, via NASA, in the public domain. How effectively do infrastructure investments lift people out of poverty? Better roads could help farmers get more crops to more markets—yet those same roads might shift economic activity away from a village and into a city. A new AidData impact evaluation explores this question in light of a major USAID road improvement project in the West Bank. The study found that road improvements did fuel economic growth, but with a caveat—economic activity also relocated. The USAID West Bank and Gaza Mission has committed $900 million to the ongoing Infrastructure Needs Program (INP) II. Part of a community-level intervention implemented under the Palestinian Authority, the program includes a variety of improvement projects for water and sanitation infrastructure, education systems, and road networks. By tackling the West Bank’s most pressing infrastructure needs, USAID aims to improve the wellbeing of Palestinians living in the West Bank. A significant part of the INP II focuses on improving road networks by repairing smaller, rural roads and connecting them to main roads throughout the West Bank. USAID wanted to know how the rehabilitation and construction of new access points had impacted the Palestinian economy. But large infrastructure investments often have unexpected spillover effects on communities, making it difficult to evaluate specific outcomes like economic development. INP II had performance evaluations planned for the midline and end of the project. Such performance evaluations can track certain economic indicators—but to be able to say that changes in those indicators were causally produced by the project, an evaluation must tease out the impact of the project itself by controlling for other factors that could affect economic development during the same time period. AidData researchers proposed that a Geospatial Impact Evaluation (GIE) could answer this question for USAID. Like randomized controlled trials (RCTs), GIEs can estimate the net effect of a specific program by comparing similar areas where the only difference was an intervention, or treatment. But unlike RCTs, GIEs use precise geographic data to establish this ‘counterfactual’ retroactively, eliminating the need to assign program participants into randomized treatment and control groups within the program design. To conduct a GIE, you need data sources that incorporate time and location information for the specific projects as well as the outcome measures of interest. For this study, USAID provided data on the road improvement projects, while satellite imagery of nighttime light intensity—a popular proxy for economic development—was used as the outcome measure. For the first time ever, AidData used its new line- and polygon-based geocoding methodology to map the road segments, allowing researchers to more accurately identify which areas might be affected by improved road conditions. The mapped road segments were integrated with monthly nighttime light data gathered from the National Oceanic and Atmospheric Administration’s Visible Infrared Imaging Radiometer Suite. To evaluate the impact of road projects on nighttime light levels, land within 5 kilometers of the improved road segments was divided into square cells of 750 x 750 meters for analysis. Nighttime light brightness was measured for each cell, each month, from before the road improvements started until after the projects were completed. Our researchers then compared post-treatment nighttime lights in each cell to that cell’s brightness levels before the road projects, as well the light levels in cells not near improved road segments. 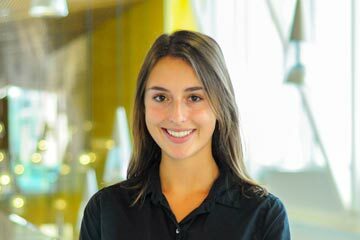 Using monthly nighttime lights data allowed our researchers to control for potentially time-varying trends, such as the implementation of a nearby employment program, or an average increase in electric lights usage because of cheaper electricity cost. At the level of each cell of land, our researchers controlled for variables that generally remain stable over time, like proximity to the nearest town. Broadly speaking, the study finds that the INP II road improvement projects increased nighttime light levels. Looking closer reveals that areas that were darkest before the road improvements actually became darker, while the brightest areas became brighter. 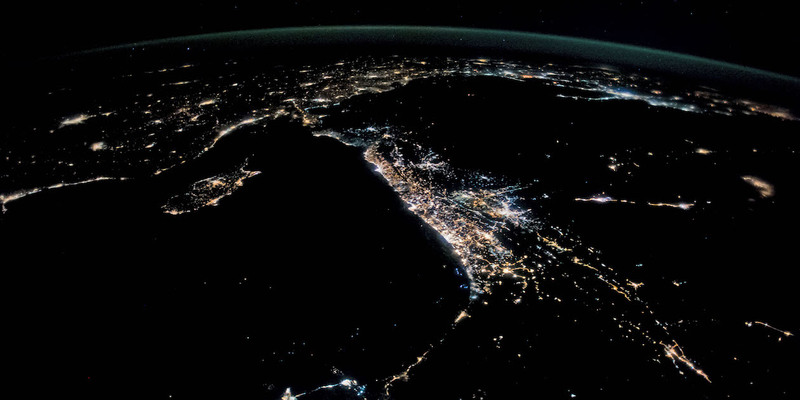 Though the increase in nighttime light in brighter areas more than offset the decrease in darker areas, this finding sparks new questions: did the economic welfare of those living in the darker areas decline? Or is it more likely that, using the improved roads, more people migrated from areas with less economic activity to brighter areas with greater economic opportunity? While the study’s models did not account for human movement and could not answer that question, future research will shed light on the relationship between infrastructure investments and poverty reduction. Moving forward, nighttime lights data could be supplemented with on-the-ground estimates of wellbeing like census or household survey data. With this information integrated into a GIE, researchers can further evaluate the nuanced ways that infrastructure investments impact the livelihoods of surrounding communities. AidData is using geospatial technologies to evaluate the real impact of international development projects across multiple sectors, from Chinese-funded infrastructure investments to programs to combat HIV/AIDS. To learn more about this study, see the full report. 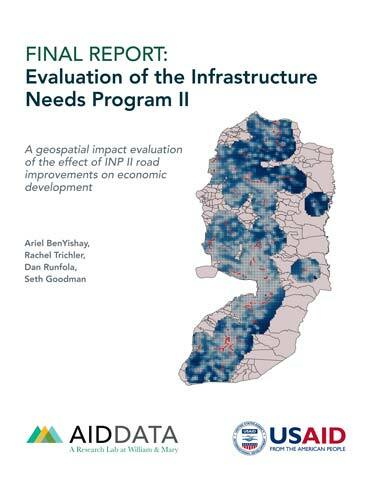 The study, Evaluation of the Infrastructure Needs Program II: A geospatial impact evaluation of the effect of INP II road improvements on economic development, was conducted for the USAID West Bank and Gaza Mission.